Rasps and files are used for shaping and smoothing and each of them serves a different purpose. Rasps are used for rough and aggressive work in many cases, and files offer more of a detailed finish. 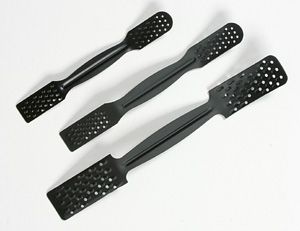 These rasps are made out of high quality steel and they come in a set of 3. These rasps are great for a wide range of uses including clay and plaster. They are Italian made from fine grade steel, and they are quenched in oil and heat treated for durability. These rasps are very high in quality and you will find that they are a useful addition to your tool set.